We read all the night golf balls reviews to compare the best light-emitting diode (LED) golf balls, flashing golf balls, and illuminated golf balls. Read our analysis of the popular ones that we found in order to learn about our best recommendation for glowing golf balls and then make your own choice. Right. Ready? Here we go! How do we help you choose one? 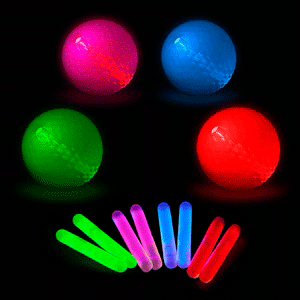 To play golf well at night you will need the best glow in the dark golf balls. How do you choose them? Your problem is that you know very little about them and there are many important things to consider. To play well, you need glowing golf balls that are easy to find them while playing in the dark. They come in bright colors that make them look like black light golf balls; however, they do not glow from being under a black light. Instead, some operate from a battery and others glow from exposure to ultraviolet (UV) light. There are two sources for the glow. Some of these are charged by exposure to UV light. This type can be recharged. Others have a lithium battery installed inside that provides the power for the LED glow. This type cannot be recharged. All of these have the same size and weight that is PGA approved for professional play. Those that recharge by a UV light source have a urethane cover over a compressed center and play like the ones used in the daytime. Those with a battery inside for LED lights have the same total size and weight; however, they are made from a harder plastic that feels different when hitting them. The UV light style is white before being charged and glows green when charged. The LED light style comes in a variety of colours that may include red, white, blue, green, pink, and orange. All of these will glow at their brightest for around eight minutes up to about 15 minutes for some. The UV type will continue to have an afterglow that is less bright, which may last up to a few hours. The LED type will glow brightly for around eight minutes and then stop. It will glow again when hit. The LED light will last for about 150 minutes in total. The LED types are not rechargeable. The UV types recharge by exposure to a flashlight for about one minute. The LED types are much brighter than the UV types. When searching for the best glow in the dark golf balls, the GlowV1 golf balls made by GlowGear are one of the strongest contenders. Their design allows them to play well. These have a one or two club advantage over others. That means your shot maybe up to 50 yards longer using a GlowV1 to make drives, when compared to others. GlowV1 golf balls are the best-hitting because they have a regular compression core surrounded by a urethane skin that contains the glowing substance. Pack Sizes: Two-count, six-count, and 12-count. Size & Weight: Meets professional standards. Glowing time: Bright for 15 minutes. Afterglow for six hours. Recharge time: 60 seconds of exposure to a UV flashlight. Golfers like the GlowV1 because they mimic the feel and performance of daytime play. The GlowV1 style is superior when compared to LED alternatives that run on batteries. They are more challenging to hit, harder on your swing, and your drives are shorter with the LED styles when compared to GlowV1 design. The GlowV2 packs are the same as the GlowV1 style. The basic GlowV2 pack has two GlowV1 for play and a UV flashlight to charge them. For serious night golfers, there is a GlowV2 six-pack that has a portable three-watt UV light that charges up to three GlowV1s at the same time. This UV light device does not require batteries. It is rechargeable by plugging it into a standard electrical socket. UV Flashlight does not come with batteries (three AAA batteries required). Bright glow dissipates after about 15 minutes. In our opinion, it will be hard to beat the advantages of the GlowV1 style because they are easy to find at night and they play well. These feel and perform in a way that is similar to playing during the daytime. Now, let’s look at a different style. 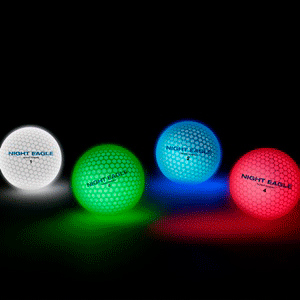 Nighthawk golf balls are one of the best for nighttime play because they are so bright. They are illuminated by an internal LED light that activates when hit. After being hit, they stay on for about eight minutes and then the LED light turns off. The light comes back on when hit again. In total, the LED light lasts about two and one-half hours (150 minutes) after activation by the first hit. With steady play, this is usually enough time for one round of play. When the LED light is off, the LED battery will hold its remaining charge for up to 40 days, if it is not yet completely used up. Colours: White, red, blue, and green. Glowing time: Eight minutes per hit. Up to 150 total minutes. The LED light is powered by an internal lithium battery. It is easier to hit one that has a solid light than one that has a flashing light. These come in a mixture of colors that includes green, blue, white, and red. Having an LED light and a battery inside makes them play differently than those used during the daytime. Lithium battery is not replaceable. A strong hit is required to activate these. It is hard to see these them before they are activated (first hit). From the choices of LED styles, the Nighthawk products are a decent choice. However, playing with them reduces drive distance and does not feel as good as other choices. Not being able to replace the lithium battery means that these have a limited use. GoBright golf balls are considered one of the best LED golf balls, with the exception that some customers’ reviews complain that if they are hit very hard they may stop working. Under normal use by regular golfers, they light up when hit. The LED light stays on for about eight minutes. The internal battery lasts up to 40 hours. The battery cannot be recharged. There is a nice assortment of colors to choose from. They are available in packs of all the same color or in a combination pack of red, white, and blue. Pack Sizes: Two-count, three-count, four-count, and six-count. Colours: Red, white, blue, pink, green, and orange. Glowing time: Eight minutes per hit. Golfers who like to play early before the sun comes up and past dusk or at night find the GoBright style to be very useful. They are easy to find in the dark because of the bright colors. The LED light and the internal battery affect the feel of playing with them. When hitting them with a driver, the driving distance may be reduced. A strong hit may break the LED light. Customer reviews are pretty good for GoBright products; however, some complain that they stop working after being used for a few holes. Everyone who complains about this problem attributes the light failure to hard hitting while driving. Night Sports USA golf balls glow brightly for up to eight minutes and then continue to glow from their patented “After-Glow” technology for up to two hours. Their brightest returns every time they are hit. They come in a pack that includes one of each color in red, blue, green, and white. Night Sports claims that they have the same characteristics of high-performance aerodynamics, weight, size, accuracy, control, and feel that match those used for daytime play. Colours: Red, blue, green, and white. Glowing time: Eight minutes per hit. Up to two hours afterglow. If one gets lost in the rough, the afterglow makes it easier to find them. Reviewers say that like other LED styles there may be a noticeable reduction in distance when driving them down the fairway. Very bright for up to eight minutes. Long afterglow for up to two hours. Manufacturer does not state total glow time. Night Sports claims these play like regular ones. However, they are hard plastic, which gives them a different feel when hitting them. Reviewers say they drive somewhat shorter than those used in the daytime. They are more expensive than others. MAXZOLA INC. golf balls are long-lasting, bright-glowing, and the best budget glow golf balls. They are rechargeable by a sunlight flashlight that is included. Pack Sizes: Three-count, 12-count, 18-count, and 24-count. Colour: White cover that glows green when charged. Glowing time: Bright for up to 10 minutes. MAXZOLA INC. night golf balls have the same look, playing feel, weight, size, and performance characteristics of those used in the daytime. Unlike LED styles that have a shorter driving distance, these balls are made with urethane around a compressed core that drives just as well as those used in the daytime. Not as bright as LED styles. Glow stick element may dislodge from the ball if it is hit hard. May not glow long enough to find a lost ball. This is a good choice for a night play from the styles that are is charged up by a UV light. The playability of these balls makes them a superior choice when compared to LED styles. For a comparison between the same type, reviewers say that they are not as bright as the GlowV1 brand. For those that are new to this night sport, here are the answers to a couple of common questions about how to play and where to play. How do you play night golf? First, be sure playing at night is permitted on the course you want to play. Besides using a nice set of glowing balls, you may want to take along a pair of night binoculars to be able to see the fairway line and the greens. Where can you play night golf? Many regular golf courses allow nighttime play. Some restrict the nighttime play to only be allowed just after dusk or in the early morning before the sun comes up. The PGA says night play is becoming more popular with more courses encouraging it. There are also many night golfing tournaments to enter. Golf Digest gives some helpful rules to follow. Golf Advisor reports that some golf courses are adding lights to let people play better at night. For those who want the night glow golf balls to have a similar feel and play like daytime ones, the obvious choice is a style that is UV-charged. They are better when compared to LED styles. Of the options for UV-charged ones, GlowGear GlowV1 is the best choice due to their stronger brightness. 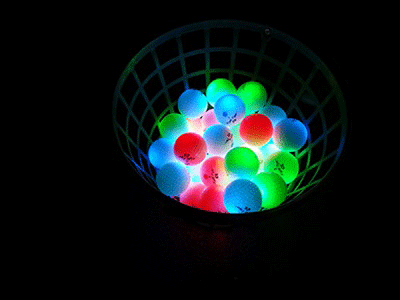 We recommend you go ahead and order some GlowV1 night golf balls to get started with your night game. Nighthawk Golf Balls: This is a good choice for an LED style at a reasonable price. GoBright Golf Balls: These are not as good as the Nighthawk brand. Night Sports USA Golf Balls: This brand is expensive. MAXZOLA INC. Luminous Golf Balls: This brand is a decent choice from the UV styles; however, it is not as bright as the GlowV1 brand. 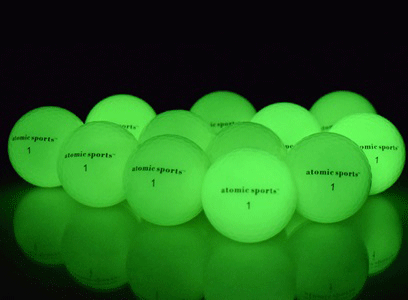 We hope you enjoyed this guide to the best glow in the dark golf balls.